e-con Systems proudly presents the eSOMgears Suite. Now in the first release, we have introduced eSOMgears-OTA, the firmware upgrade solution that provides reliable & secure upgrades to your embedded devices, over-the-air. 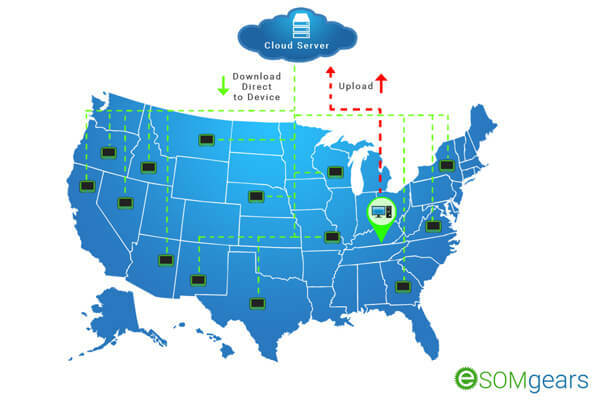 Using cloud technology, eSOMgears remotely connects to the devices and updates the required firmware. Soon, we are coming up with eSOMgears-Monitor for health monitoring of devices and also eSOMgears-Manage for remote provisioning and management of devices. When thousands of devices are built, shipped and deployed in the field, regularly updating the firmware has become a necessity. eSOMgears is a robust value-added service to the customers who have built their products based on e-con's System-on-Modules (SOMs). Supports both Linux & Android.